Enjoy the central location near golfing bird watching and Santa Cruz plus free breakfast and Wi-Fi at the Americas Best Value Inn a short walk from downtown Watsonville and short drive from Monetery Bay. All 28 rooms at the two-story Americas Best Value Inn offer free Wi-Fi microwaves mini-fridges cable TV hairdryers and irons. Fuel up for a busy day at the complimentary continental breakfast. Fax services are available at the 24-hour front desk. Less than a half-mile from downtown Watsonville the Americas Best Value Inn is within a 15-minute drive east of Sunset State Beach and 18 miles southeast of the Santa Cruz boardwalk. Golf enthusiasts are within a four-mile drive north of Pajaro Valley Golf Club while nature lovers discover the Elkhorn Slough National Estuarine Sanctuary less than 20 minutes away. A 10-minute drive also leads to family fun at Santa Cruz County Fairgrounds. Monterey Peninsula is within 30 miles of the hotel. 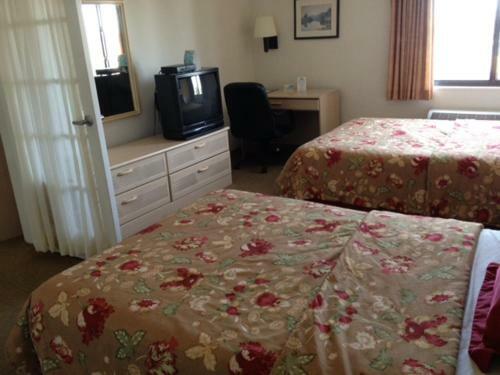 The Americas Best Value Inn provides guests with their favorite free features including Wi-Fi plus easy access to downtown Watsonville and Monterey Bay.